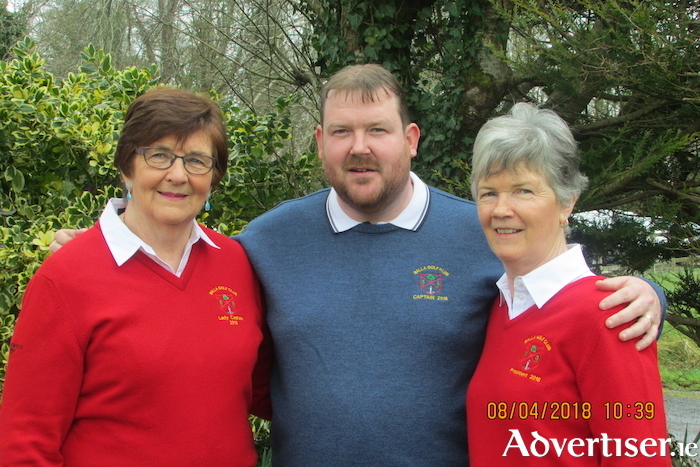 Lady captain Julie Loftus, captain Paul Murtagh, and Balla president Carmel Henry prior to the Captains' Drive in last Sunday in Balla Golf Club. Spring is in full swing and so is the action in the clubs around Mayo. The Winter League has finally come to an end and the winners were the trio of James Waldron, Paraic Cresham, and Breege Walsh, second place went to the team of Paul Cuffe, Paul Murtagh, and Carmel Henry, with third spot being claimed by Ronan Mahon, Tommy Walsh, and Rose O'Connor. Breege Jennings was the top female player in the league with James Waldron the top male golfer in the competition. The recent Stableford gents' competition was won by Gus Heraty with a score of 35, Ronan Mahon finished in second place, and Pauric Cuffe came home in third spot. The ladies' competition was won by Aisling Prendergast with a score of 34pts, Kathleen Minogue finished in second place, and Breege Jennings finished in third place. The captains' drive in scramble was won by the team of Marie Cresham, Padraic Cresham, and Stephen Minogue, second place went to Derek Reilly, Mick Mellett, and James Waldron, with the third place was claimed by Berine O'Connor, Pauline O'Connor, and Helen Byrne. Last Sunday's competition was won by Malcom Nash with a score of 42pts, he finished one point in front of PJ Ruddy in second place, and third place went to Kenneth Sheridan on 40pts. Colm Keane was the winner of the gents' competition last weekend with a score of 40pts, Mike Fahy finished in second place, the gross prize going to Gary Brett. The category winners were John C Burke, Brian Finnerty, and Paul Keane. The front nine competition was won by Pat McDonald on 21pts, with Willie Connolly winning the back nine competition with a score of 19pts. The ladies' competition was won by Louise Cribben with a score of 39pts, Phyllis Lee finished in second place, Carmel Sweeney came home in third place, and Aine Melville finished in fourth spot. The front nine competition was won by Helen Ryan, with Catherine O'Toole taking the back nine win. Last weekend's competition sponsored by Delaney's Bar was won by Enda Kenny with a score of 41pts, his back nine play saw him edge out David Burke into second place and David Murphy in third spot. The ladies' competition was won by Anne Hussey with score of 36pts, she just edged Margaret Dyer into second place thanks to her back nine scoring, with Laurena Freeley finishing in third place on 34pts. The gents' competition last weekend was won by Martin Lynskey with a score of 50pts, he finished seven points ahead of Mike McNamara in second place with Declan Lambe coming home in third place on 41pts. The ladies' competition was won by Carmel Kilgallon with a score of 33pts, the nine-hole competition was taken by Florrie Campbell on 20pts, with the birdie competition won by Martin Lynskey and Padraic McHugh. The inaugural Westport Masters Single Stableford competition was won by Pete Healy with a score of 42pts, with Martin Gilleen coming home in second place and John Connolly finishing in third place. The gross prize was won by Michael Joyce and the top visitor finisher was David Walsh from Castlebar Golf Club. The ladies' competition was the Donie O'Connor memorial cup which was won by Sabina O'Flynn with a score of 73 nett, Marion Duffy finished in second place, and Rachel Harrison came home in third place.